At 72 my memory is still pretty good. This photo was taken either 1968 or 1969. Quinnipiac Council should be able to verify. These are the greatest boys I ever had the pleasure of working with. Registration Night I know I upset some parents & Council. I pioneered the membership of mothers on the Committee. When announcing the formation of the troop I required each boy had to bring at least one parent to enroll, & the number of boys was set at 32. As each boy appeared, I told the parent(s) either the mother or father had to resister as a Committee Member & it didn't matter which one. The typical excuse I received was; "I don't have time." My response was, "If you don't have time for your son, why do you expect me to have time for him?" They were disgruntled, but we got our Committee, I dealt with Council accordingly, & our Committee did an outstanding job. Not long after we had a "Covered Dish Supper" in the church hall & it was a pleasant evening for all. Parents discovered they did have time & it was rewarding to be involved in their son's scouting life. I treasure these memories. Having grown up in Branford, I loved parades; but it bothered me that the scouts were always at the end. In time I realized it was because they lacked training in marching & frankly did not make a good appearance. The troop was new & I had no desire to make our 32 boys march at the end. I talked to the boys & what followed was a one hour drill every Sunday afternoon in the parking lot of Tabor Lutheran Church. When they finally knew how to march & present themselves, I wrote a letter to who ever was parade marshal, explained things, informed him Troop 428 would not march at the end, & invited him to see the troop drill on a Sunday afternoon. He accepted. He was blown away by what he saw & I received a letter from him stating that Troop 428 would lead the second section. Needless to say, the boys, parents & myself were delighted. But we had more work to do. The Sunday Drills continued, only this time I trained them in the command "Eyes Right" when passing the reviewing stand. With four patrols, we had four patrol flags & they became our Guide On Bearers (right side file position). I taught them a version of "The Queen Anne Salute". They were so sharp & proud of themselves. The day of the parade, As we came to the Reviewing Stand & I gave the command "Eyes.....Right" - the Guide On Bearers tilted the patrol flags 90 degrees backward; and on the execution of "Right" they rotated their flags 540 degrees making a full forward circle plus 180 degrees to place their patrol flags in a forward position to "salute" the Reviewing Stand. As Scoutmaster I had to hand salute & look right to the Reviewing Stand & could see their perfect execution of the command. Everyone was so proud, but we didn't know just how much we impressed our viewers until after the parade. I was approached by U.S. Marine Captain Jack Curie (BHS Graduate) & he told me he had never seen an "Eyes Right" executed so perfectly; not even in the Marine Corps. Of course I relayed that to our boys & parents. The history of the troop is so rich & it's the boys who produced it. I will continue to share with you as long as you wish. What 428 did in their first year, exceeded what many troops accomplish over several years. Of course that's just the opinion of their scoutmaster. Having 32 boys & four patrols made equipment needs easy to determine. I made out the list of items the troop needed, then ran it before the Committee before acting on it. I'm guessing the total amount needed was around $1,200 including 4-tents, 4-patrol cook kits, axes, etc. It outfitted four patrols for camping out overnight. Our American Flag was donated by the Branford American Legion Post 83, the troop[ purchased it's Troop Flag which of course was a custom order. How Money Was Raised: The back pages of Boy's Life listed various fund raising products. Regardless of products chosen, the supplier paid all expenses, including returns of items not sold. The troop received 40% of all sales & the products were all good quality. The 32 boys sold everything from greeting cards to candy. We had a break between fund raisers so we didn't wear out supporters. I took the amount needed, divided by 32 boys, & every boy had to sell that amount, No more, no less. That way the equipment purchased truly belonged to all the boys & no boy had to do more than his share. After purchase of the equipment & the first camping trip, it was inspiring to see the boys monitor each other for proper use & care of their equipment. Needless to say, no one was disappointed when fund raising was over. 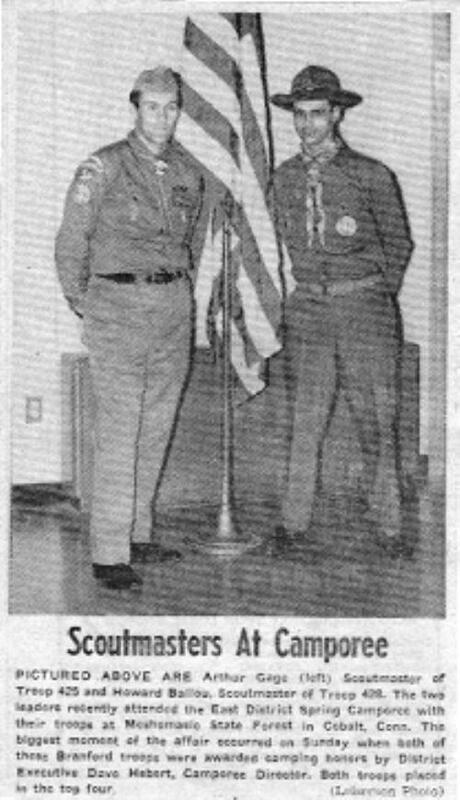 The attachment, copied from the 40+ years in the Branford Review, is of Scoutmaster & friend Art Gage, Scoutmaster of Troop 425 (Branford) & myself following Troop 428 First Camporee. How the boys prepared for their first Camporee. We had cook outs prior to their first camporee. I would not allow sandwiches, hot dogs, hamburgers or food in a can. They had to learn to cook from scratch. Needless to say their scoutmaster was not a source of joy at that time. Their first camporee was a DISTRICT Camporee, competing against several other experienced troops. The boys were nervous, so with learning how to cook from scratch, which was by patrols, which meant a cook team had to prepare a full menu for their entire patrol (8-boys) I had also to instill self-confidence. They were great learners all. At the camporee they learned more by visiting competing troops. One of our boys saw another troop "cooking" hot dogs. The boys were not rude, but I over heard one boy say; "Doesn't your scoutmaster teach you how to cook?" The more they saw, the more they learned. They also had Reflector ovens. I remember one patrol baking a great cake; another fresh biscuits. Children will learn whatever you are willing to take the time to teach them. "Hey guys; our scoutmaster has been teaching us how to be the best!" God love them. Result of 3-Day Camporee that started on Friday night & ended Sunday afternoon with awards. It also includes a confession from me, which as far as I know, the boys never told about. Troop 428 the Rookie Troop in their first camporee took Second Place! Dave Hebert, our Scout Executive came to me on the QT & what he told me brought tears to my eyes. He said he wanted me to know that 428 would have taken First Place, except one of their many trips into troop camp sites for scoring, revealed a cooking fire had been left unattended in our camp. When he asked about the tears; I told him it was my cook fire & I was the one who left it unattended briefly; not one of the boys. I think Dave felt as bad as I did. He was a great Scout Executive. It's a good reminder that scoutmasters are human too. From that point forward, there was no stopping them. They had learned what discipline & team work can do. ROGER POIRIER was maybe a year behind me at BHS. We used to call him "Frogy" because of his deep frog-like voice. It was not out of disrespect, but out of love for this serious & honest member of BHS. Long before Troop 428 was formed. Roger & I belonged to Troop 1, Short Beach. If my memory serves me right, I was Roger's Senior Patrol Leader. We had a wonderful & dedicated scoutmaster; Bill Tucker. Roger was the epitome of the Scout Oath & Law. I don't know his enlistment date, but Roger enlisted in the United States Marine Corps. He gained promotion to Sergeant & was deployed to Viet Nam. As a Marine Sgt, & was in charge of platoons & patrols. His unit was ambushed by the VC (Viet Cong) & he was sent to St. Albans Naval Hospital in NY. It took a long time, but they put Roger back together again & returned him to duty in Nam. In WW II that was considered the "Golden Ticket Home". Our government changed the rules. I don't know how long Roger was back in Nam, when his unit was ambushed again. Back To St. Albans Naval Hospital & an additional putting together. I was appalled when after that long recovery, he was returned again to the front lines. In all fairness to our military & others; knowing Roger; he probably requested it, as not to abandon his men. When he returned, his unit was ambushed again & Roger was killed in action on August 2, 1967 in Viet Nam, on his 21st Birthday. I violated the Scout Law of "Brave" that night & got drunk. He was in a much better place, but the world lost a real leader & hero. I saw the Marine Honor Guard unload his metal casket in front of the Congregational Church in Branford; the church I grew up in. It remained "closed" for obvious reasons. My heart grew heavier. I attended the burial in Center Cemetery. They did not have a firing squad or Bugler. I believe this was out of request from his Mother. Believe me, if you think your "tough", don't ever attend a military funeral with Full Honors. It will test your metal. For months I was driven to find a way to honor Branford's Fallen Hero, After the formation of Troop 428, it came to me. At the time I worked for Goodkind & O'Dea Consulting Engineers in Hamden. Frank Serafino was a fellow draftsman with our firm, who was a very talented artist. I furnished Frank a photo of our beloved Sgt. & asked him to do a charcoal sketch. When he finished, it was as though he copied it on a copy machine. Frank would not accept any money for it. I finished the framed Tribute (In Photo Attachment) to Sgt. Poireier, & the Committee gave unanimous approval. The Outstanding Scout who received this award each year, also received expenses paid for one week at Camp Sequassen. My visit with Mrs. Vernal Warner Bates in Branford was most rewarding. Her late husband was one of the original Founders & promoters of Camp Sequassen, & who, for many years served the Boy Scouts of America in the finest tradition. She agreed to let the Foundation pay for the week each year in Camp Sequassen. The night the SGT. POIRIER AWARD was unveiled, His mother, Mrs. Leo Poirier & his younger brother Brian were present. It hung on the Meeting Hall wall to give incentive to the 32 members of the troop to exemplify the Scout Oath & Law throughout the year. At the end of the Branford Review write up, you will note reference to Troop 428 being congratulated by John H. Tweed, Fire Marshal of Branford; & Doinald E. Jackson, General Manager of the New Haven Water Company for fighting the fire at the Supply Pond. We were on a Saturday Cook Out, when one of the boys discovered a brush fire that could have resulted in serious consequences for Branford. None of the boys hesitated when I said; "Let's go, we've got a fire to put out." You will also note that this new, inexperienced troop trained & provided Den Chiefs for the Cub Scouts Packs. No scoutmaster could ask for more, & certainly parents stood tall with their boys. God Bless them. When I left for assignment in NJ, this framed plaque was still on the wall. I pray it remains a Troop 428 incentive to instill boys to strive for their very best as Scouts & Americans. We also placed flowers on Roger's grave in Center Cemetery on Memorial Day with a Scout Honor Guard. The florist at the entrance to Center Cemetery on Montowese Street made the first arrangement of Yellow Mums & would not accept any payment for it. I believe it was Mr. Monroe; another Patriot. First Recipient of The Sgt. Poirier Award: Attached is the scaned Newspaper Clipping from the Branford Review, showing Steve Leiserson, the first recipient of The Sgt. Poirier Award. Steve was one of our junior leaders, & was one of six candidates competing for the award. As I recall, Committee Members & myself interviewed the six candidates, compared our notes & agreed on the selection. That is a BSA Trophy Steve has in his hand with his name engraved on it, the year, & "The Sgt. Poirier Award." in addition to a paid week at Camp Sequassen. His name was placed on the Award Plaque. Original Neckerchief of Troop: The original neckerchiefs were custom cut & sewn. Following a discussion with the boys, a plaid type pattern with red white & blue was agreed upon. The cloth was purchased with troop funds. The boys liked the idea of having a neckerchief unlike other troops. Building Fires Without Matches: Before the second Saturday Cook Out at Branford Supply Pond, The troop had been taught starting a fire with Flint & Steel, and by the Indian Bow Method. At the second cook out, all patrol fires were started with out matches, using both these methods. They did well & displayed these methods at the District Camporee. To further thier fire building skills, each patrol started with one stout, seasoned log about two feet long. They had to get everything from that one log for their fire. That meant splitting the log & making different sizes of fire wood. Before starting, each fire had two green stakes on each side of their fire area. Two strings were tied between the two stakes. One at 12" above the ground. The fire wood could not be constructed beyond that string. The second string was 24" above the ground. It was a contest between patrols. Everyone started at the same time. No matches could be used. Which ever patrol split up their log, constructed the fire, started it without matches, & burned through the high string first, won. They were the best fire builders around. Learning how to use an ax & a hatchet safely, took place prior to this. St. Theresa Church in Stony Creek, Branford. to the Westwoods Trail System. to Shepards Point at Killiam’s Pt. Branford, Ct.
Elks Club in New Haven, Ct.
on Kelsey’s Island in Branford. room in Short Beach, Branford. Connecticut, Marine Grant Research Program. that were damaged, vandalized or covered. at the Mary T. Murphy School in Branford, Ct.
Short Beach Union Church in Branford, Ct.
at Trinity Church Rectory in Branford, Ct.
path around Lidyhites Pond, Branford, Ct.
room at the East Shore Day Center in Branford, Ct.
at Branford Fire Headquarters in Branford, Ct.
Day Care Center in Branford, Ct.
Care Center in Branford, Ct.
Company 4, in Branford, CT.
trust property in Stony Creek, Branford, Ct.
St. Theresa Church, Branford, Ct.
Tinari Basketball League in East Haven, Ct.
in the Newhallville section of New Haven, Ct.
Point Conference Center in Branford, Ct.
and Epiphany Church in East Haven, Ct.
faculty room of the Branford Day Care Center. students of the High School In The Community in New Haven, CT.
2003 William Farley: Organized and conducted a food drive, collecting over 5000 lbs. of food for the East Haven Food Bank in East Haven, CT.
Pardee Park, Short Beach, CT.
St. Elizabeth Church in Branford, CT.
Cross , in East Haven , Ct.
Pediatric/Oncology Associates P.C in Guilford, CT. The patients select a toy that is given to them when they have finished chemotherapy. cemeteries in Branford, CT. Copies to V.F.W., American Legion, Branford Historical Society, Blackstone Library. Flax Mill Soccer Field of the Branford Recreation Department in Branford, Ct.
built , painted and installed shelving in storage closet at the Daniel Cosgrove Animal Shelter in Branford, CT.
Court #1 at the Branford High School Tennis Courts. Two terraces, each 8 ft. x 20 ft in size, has a front timber bench edge and a lawn surface for sitting directly on the lawn or on lawn chairs. The immediate hillside area was cleared of years of growth and seeded for additional lawn area.